If you have a 2-way account and would like your replies to go to a predefined email address, you can use the Email forwarding option to do this. Simply click into Echo for Email, and then click ‘Settings’ followed by ‘Receive’. You need to select the second tick option and then populate the text field with the email address. You can enter more than one email, just make sure they’re separated with commas. Once you’ve done this, please make sure you click the green ‘Save’ button at the bottom of the page. You also have a Direct reply option, which is enabled by default. The Direct reply option works by storing the originating email address used to send a message to a mobile number. Once that mobile number responds to your message, it will forward the reply back to the email address which sent the message. 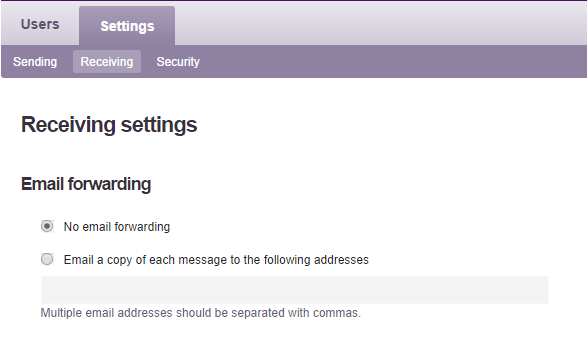 If you have both direct reply forwarding and email forwarding on, you might find that you will receive two copies of an inbound message, so it’s recommended to only have one of these settings on.